These photos were taken on my December 2012 trip to Cape Pillar. Previous Cape Pillar trips can be found here and here. 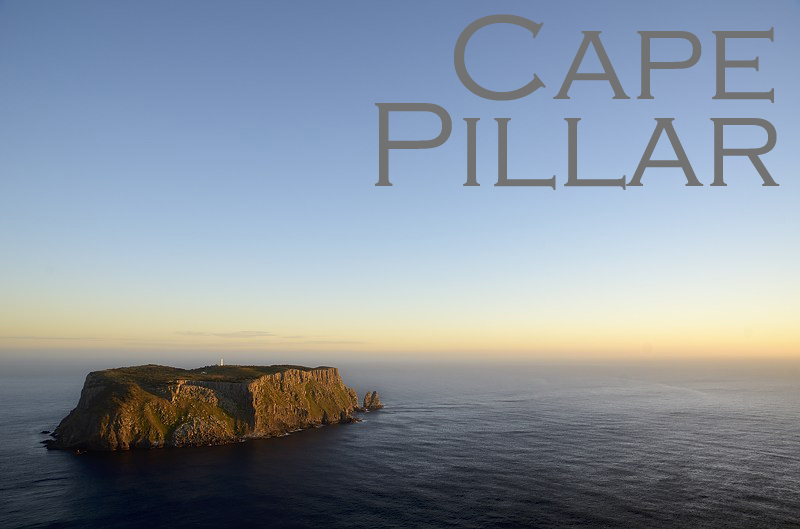 Views of Cape Pillar from elsewhere can be found amongst the search results here. 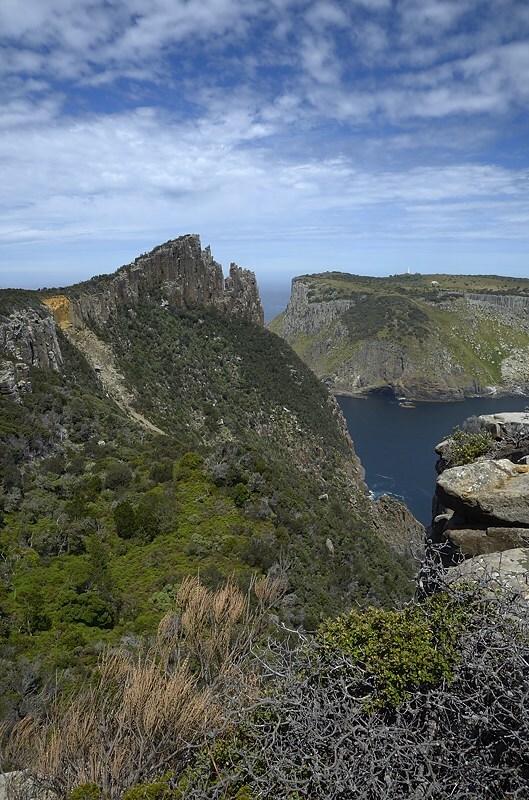 Tasman Island is a spectacular view from many places on the cape. The lighthouse has been saving seafarers from catastrophe since 1906. Find the details here. The island is formed of Jurassic dolerite, as is the whole cape. The Blade, Cape Pillar. This is one of the most spectacular features of the area. 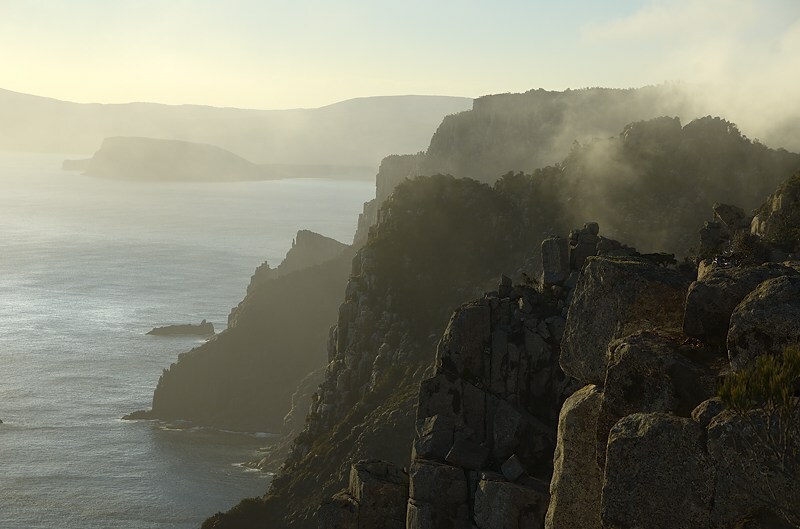 you can climb to the highest point for airy views of the cape and Tasman Island. Great care is required in windy weather, as sections are narrow and precipitous. 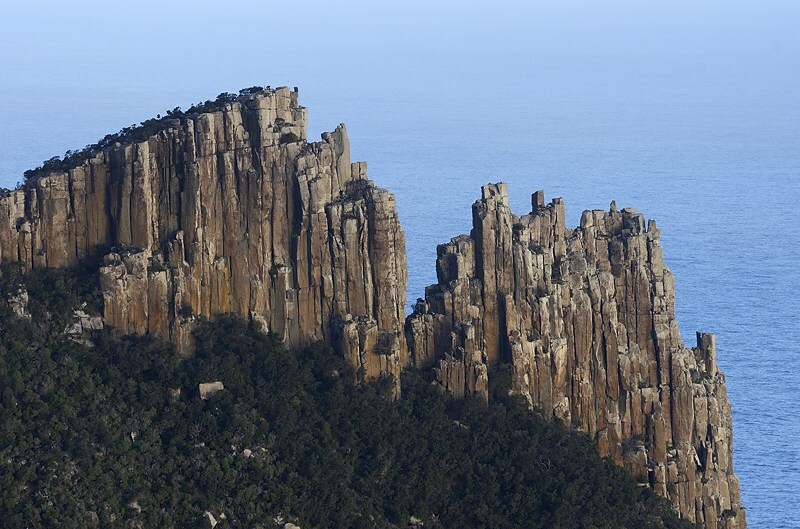 The Blade is formed of classic dolerite columns, seen in other well-known formations such as Cape Raoul and the Organ Pipes on Mount Wellington. 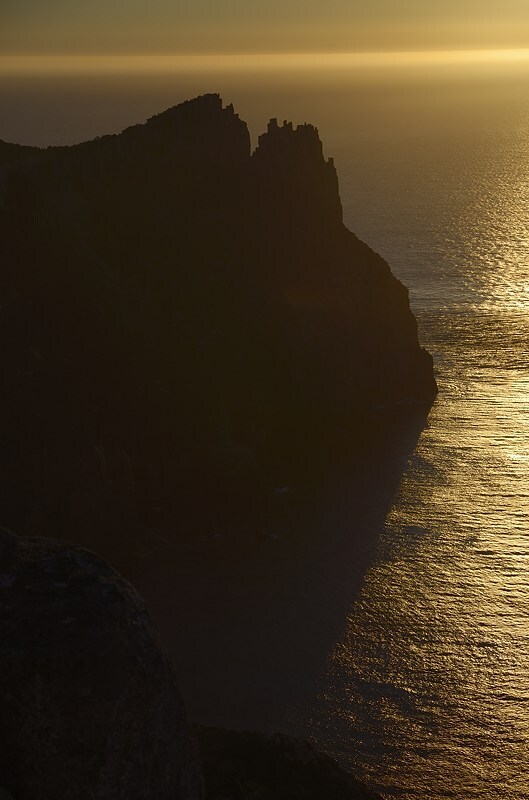 Cape Raoul seen from Cape Pillar at sunset. Cape Raoul is also formed of dolerite, but was used for target practice by the navy during World War I, and is missing some of the columns which should stand at the end. 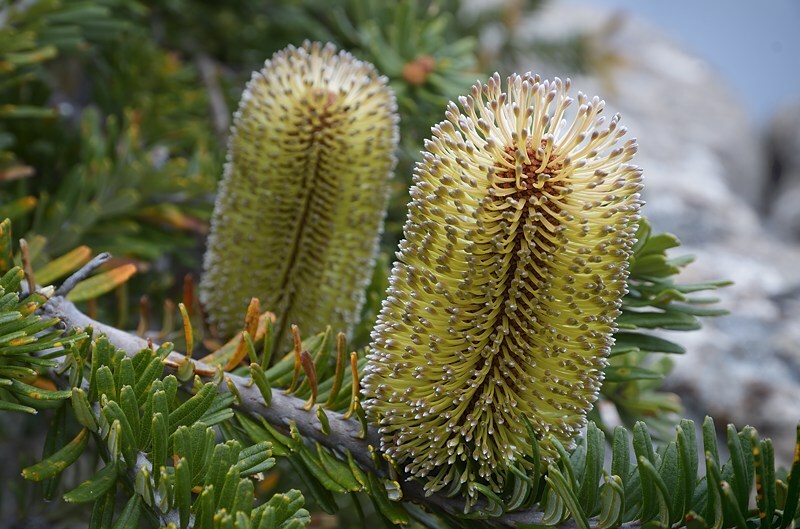 Banksia marginata, the Honeysuckle or Silver Banksia, was in full bloom in early December on the Cape Pillar peninsula. (Multi-shot) panorama of the cape from the top of The Blade. 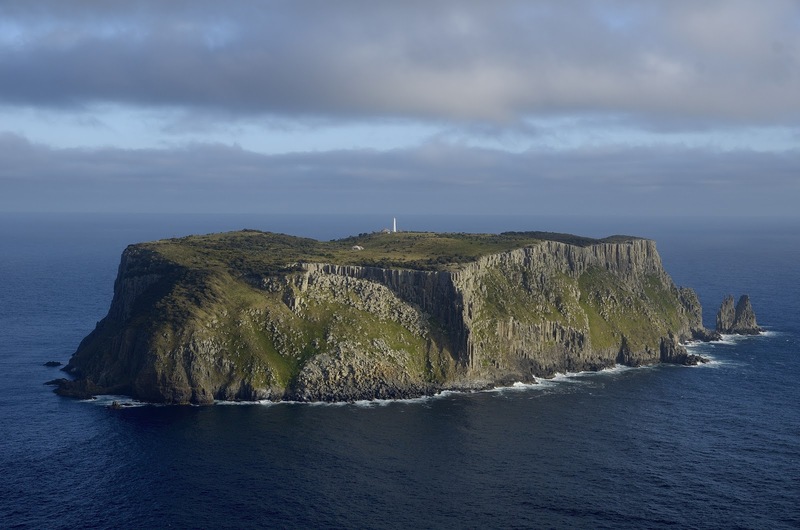 From here we can see the three capes, Cape Raoul at far left, Cape Hauy right of centre in the background and Cape Pillar being the highpoint to the right. 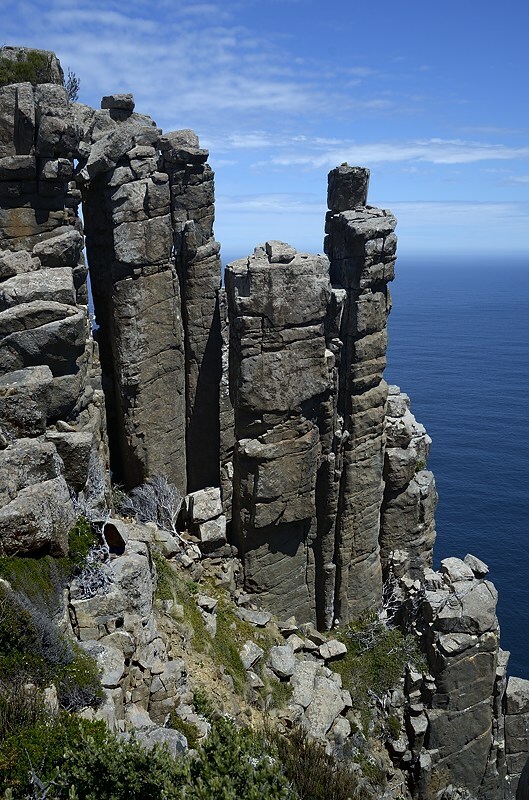 You can climb to the two summits at the end of Cape Pillar and they are well worthwhile, although the most spectacular views are probably had from this highpoint of The Blade. The entire walk is decorated with these bright markers and various tapes. I presume they are part of the survey of the track for the improvements planned for the Three-Capes Walk. I will post some more information about this shortly. The Blade and Tasman Island from one of the many vantage points along the track. The walk to the end of the cape is slowed by both the steep rough terrain and the stupendous views which appear alongside you as you traverse this landscape. Note the landslip and ongoing erosion evident in the cliffs this side of The Blade. Dolerite columns. 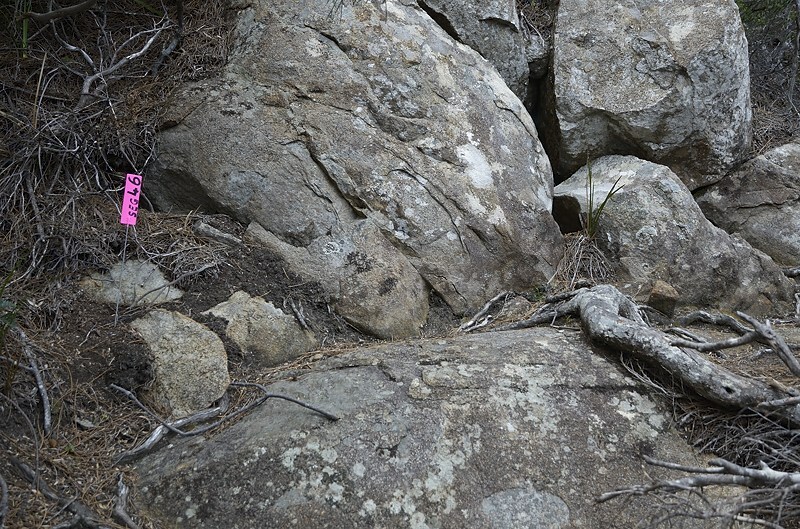 The rocks end up balanced one upon the other, the result of weathering. In places you wonder how they remain standing. One day of course, these will collapse, and leave a huge scar in their fall to the sea below. Evening sea mist shrouds some of the cliffs near Perdition Ponds. This view looks west towards Mount Brown and Crescent Beach, both of which can be seen in the background. This spot is about 10 or 15 minutes walk beyond Perdition Ponds, and at the right time of year and in the right weather is a great place to take both breakfast and dinner for sunrise and sunset views. It is the last obvious lookout before the track descends towards The Oasis, and provides this most awesome grandstand view. 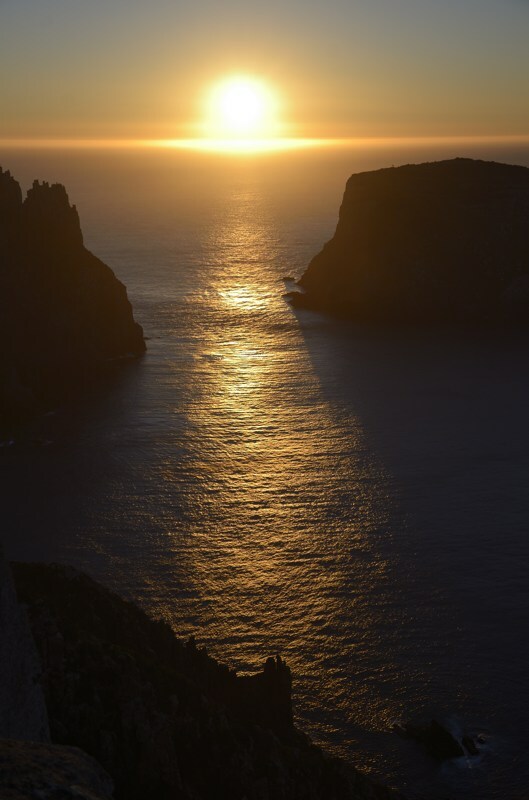 Here the sun sets on Tasman Island and The Blade. The cliffs below here are close to being the highest on the peninsula at around 270m. This place is truly spectacular. A head for heights is useful. 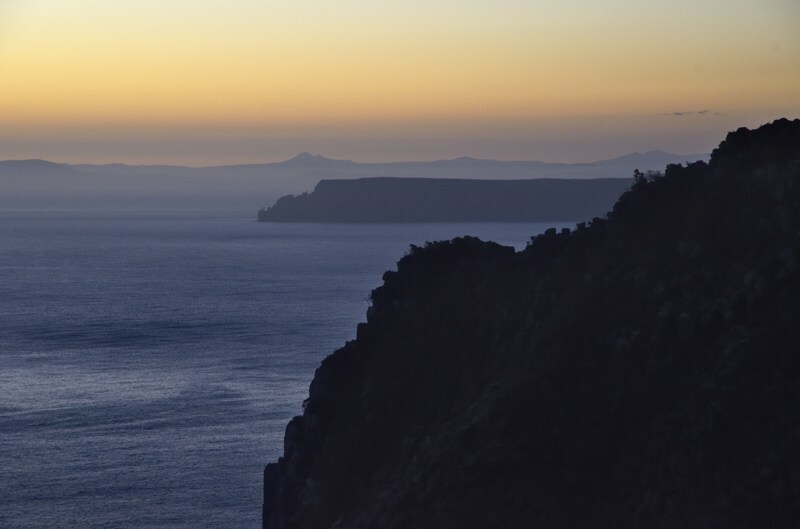 Adamsons Peak can be seen beyond Cape Raoul in this westerly view after sunset from Cape Pillar. This was a marvellous evening, with calm seas, gentle breezes and superb views all around. 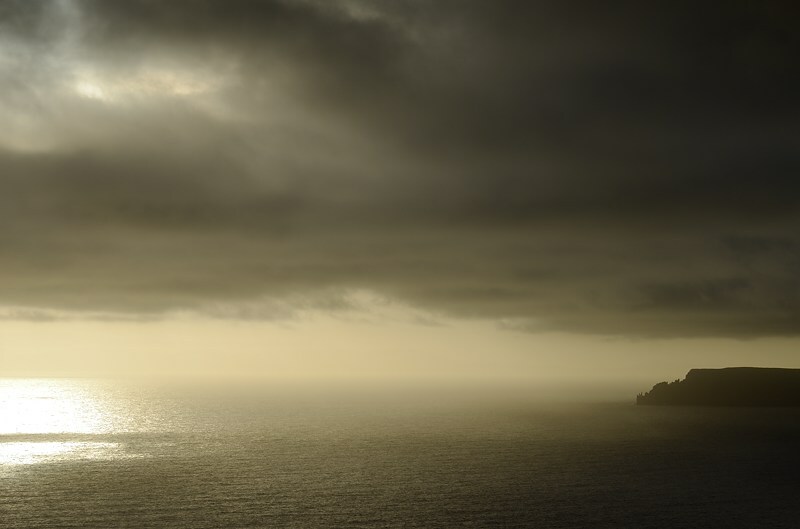 The next morning the sun rises between the cape and Tasman Island, as seen from the same lookout. The Blade at sunrise. 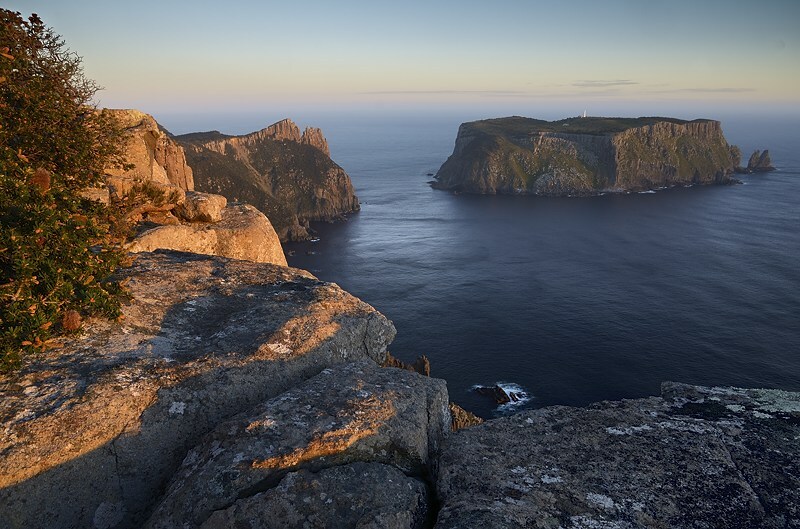 Tasmania proves once again to be one of the most beautiful places in the world. Great photos Mark and useful information about the walk. Great photos and useful information about the track.